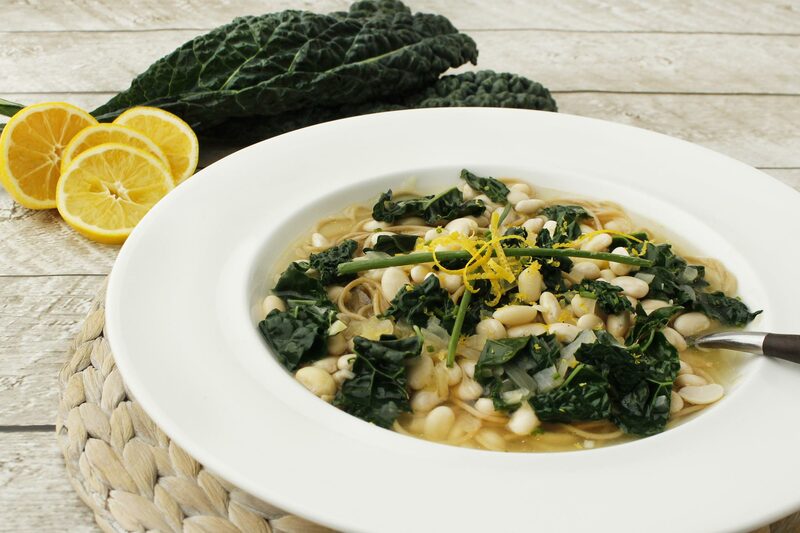 This healthy and light-flavored soup is comforting yet hearty enough to be a meal. This soup would also be a great refreshing meal when you just can't look at another holiday cookie and need something nourishing. Rinse and soak the beans in cold water overnight for at least 8 to 12 hours. Rinse and set aside. Alternatively, you can “quick soak” them by bringing 8 cups water to a boil. Add 2 cups beans and cook for 3 minutes. Remove from heat, cover and let stand 1 hour. In a large soup pot, on medium heat, sauté the onion and garlic in 2 tablespoons olive oil, until translucent, about 2 minutes. Season with salt and pepper. Add the vegetable stock, juice from one lemon and the cooked beans. Simmer for 40 minutes, or until the beans are soft and tender. In another pot, boil 8 cups water and 1 tablespoon sea salt. Add the angel hair pasta and cook for 5 minutes only (the pasta will cook more in the soup). Drain, toss with olive oil to prevent from sticking and set aside. Once the beans are tender, add the cooked pasta and Parmesan cheese, and continue to simmer until the pasta is al dente, approximately 8 minutes. Add the kale and simmer until tender. At this point, you may need to add some boiling water to the soup, as some of the stock may have evaporated (1/2 – 1 cup should be sufficient). Spoon into a bowl, garnish with lemon zest, chopped chives and grated Parmesan cheese. Serve warm.